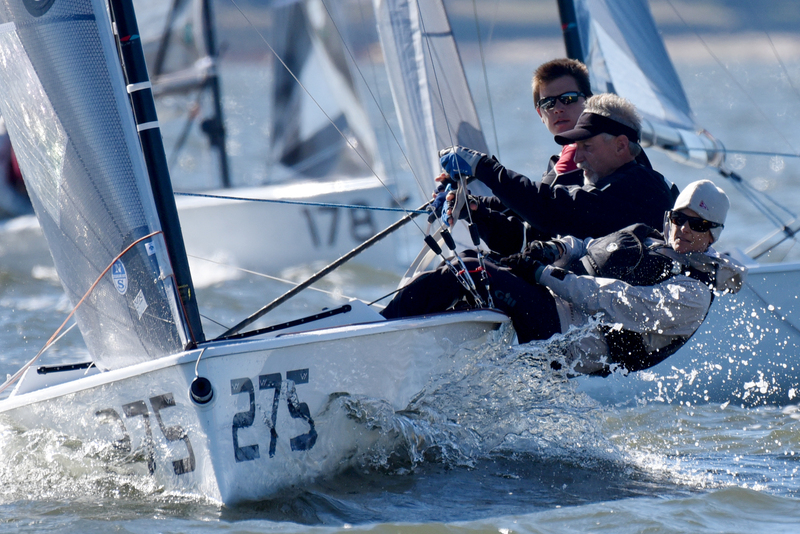 Sunday closed out the third and final VX One Winter Series at the Sarasota Sailing Squadron. After drifting for hours, Sarasota waved goodbye to the VX One fleet with a solid 8-10kt sea breeze to add two final races to the series. While no sailing was had on Saturday, plenty of swimming and piña coladas passed the time. Friday proved to never underestimate the ability of mother nature when an under 6kt forecast turned into 12-14kts and blue skies, making for the best racing of the March stop. At the end of the 6-race series, class President Jeff Eiber took home 1st place, followed by Sam Padnos in 2nd and Bill Lydens rounding off the podium in 3rd. 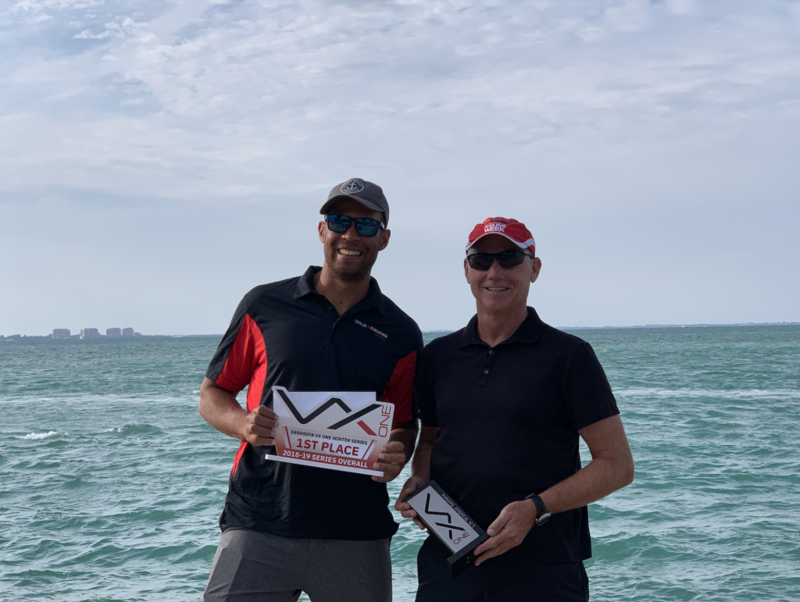 Working backwards, the Sarasota Sailing Squadron welcomed the VX One class back in February for the second event of the series. This two-day event brought sunny skies, warm weather and 15kt breezes to make for competitive racing. Ian Maccini, of Blue Lobster, commented that “it is more than just a competitive fleet that makes this class, it’s the venue [Sarasota Sailing Squadron] that keeps us sailing and coming back.” 7 races were enough to let father-son duo and VX One designer Brian and Hayden Bennett to win a tie breaker with Jeff Eiber for 1st place. Eiber claimed a strong 2nd place, followed by Canadian Paul Currie in 3rd. 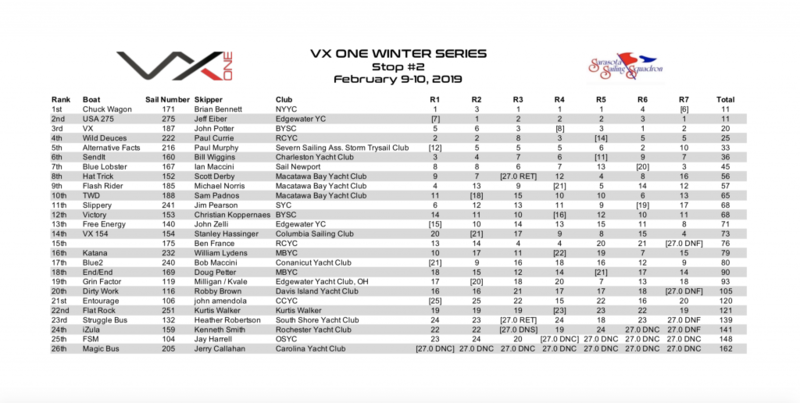 The first event of the VX One Winter Series in January tested the fleets ability to handle heavy breeze and produced some of the most exciting racing of the series. Saturday showed steady 20kts with gusts into the thirties. The class handled the conditions well, with the all-girls team JUGS (Just Us Girls Sailing), comprised of Kelly Cole’s 148, managing to stay upright while hitting a top speed of 17.9kts during the first downwind of the day. Sunday was out of range, with gusts into the 40s, for the VX One class but that didn’t stop their competitive spirit that they took to the go karting track, unfortunately those points did not count overall, just bragging rights. 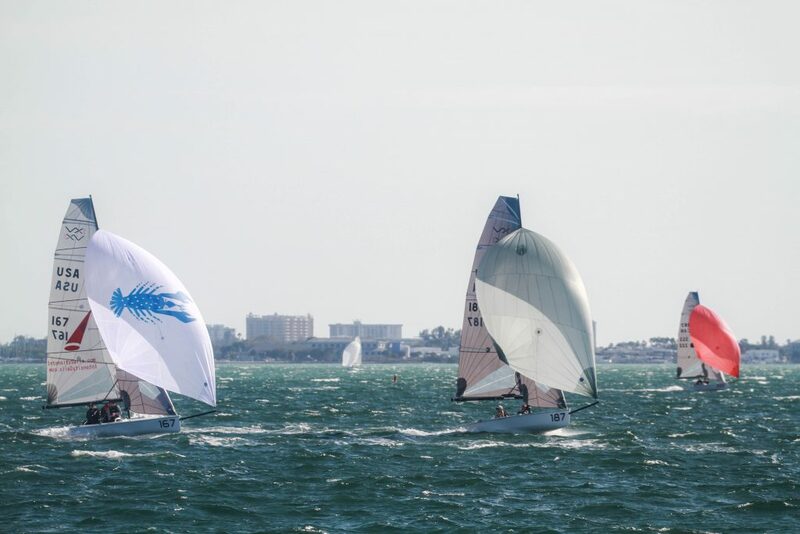 Sarasota Bay once again kept the fleet on their toes and tested their abilities on Monday with breeze that was light and shifty. Chris Alexander was able to connect the puffs to bring home 1st place, followed by Paul Currie in 2nd and John Potter in 3rd. 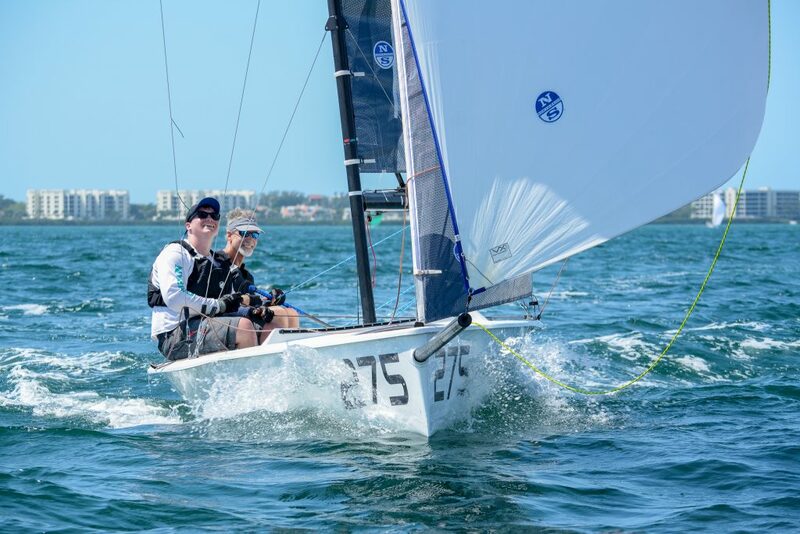 Just a couple weeks after a fantastic Midwinter Championship, the fleet was back in action on Sarasota Bay competing in the second stop of the 2019 VX One Winter Series. Sunny skies, warm weather and breeze around 15 knots made for two fantastic days of VX racing! Brian and Hayden Bennett on 171 were back sailing together for the first time since last winter and took the overall win after a close battle with class president Jeff Eiber on 275. See below for full scores and stay tuned to our social media channels for photos and video coming soon. The final stop of the 2019 VX One Winter Series will take place March 15-17. Up and down the field the racing was superb, with too many great performances to highlight. 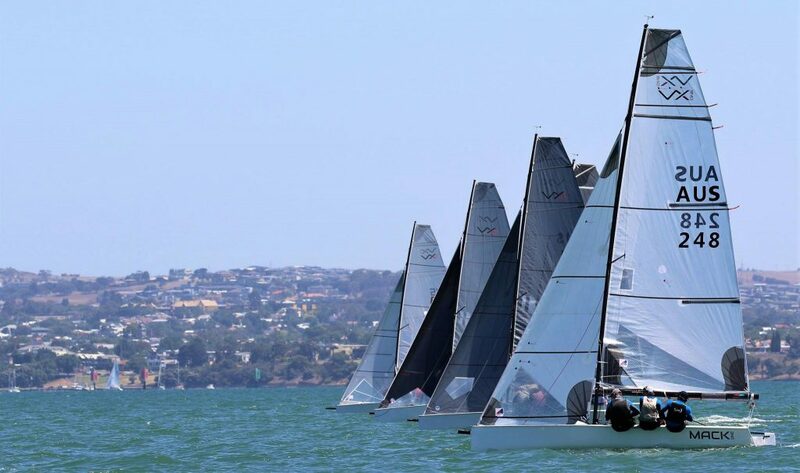 Royal Geelong Yacht Club turned on a magnificent regatta on and off water, with the festivities ashore only matched by conditions which saw 4 different breeze patterns in 3 days, warm sunny conditions, and a track which threw everything at the competitors. Another great event for the VXOne class down under! If you missed the livestream with commentary you can watch replays on the VX Australia Facebook page here. 25 boats competed in the 2019 VX One Midwinter Championship hosted by Sarasota Sailing Squadron in Sarasota, FL. Saturday saw big breeze with the wind consistent in the low 20s with a few gusts over 30. The VXs showed what they were built to do by surfing around the course at speeds over 20 knots. By Sunday, the breeze was gusting close to 40 which kept the boats at the dock. Monday was light and shifty as a result of the departing front which made for tricky conditions. The boats that were able to connect the pressure dots came out on top. At the end of the weekend it was Chris Alexander’s Counterproductive (USA 276) who took the top spot. Welcome to the 2019 VX One Winter Series! Stay up to date with all the action on our Facebook page! We will be posting photos, videos and event updates throughout the weekend, and then check back here after the event for a full writeup. Results will be available here. With North Americans now in the rearview mirror, it’s time to start thinking about the winter! 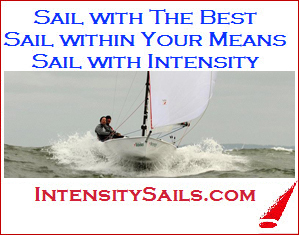 Sarasota Sailing Squadron will again host our legendary winter series. Sublime downwind planing on Sunday capped off 3 days of awesome racing between 29 boats at the VX One North Americans in Charleston, SC. The regatta kicked off with boats from as far away as Toronto and Dallas participating in practice starts and races on Thursday. On Friday, Tommy Harken’s excellent Race Committee team, held 4 races lasting about 40 minutes each. Foreshadowing things to come, Chris Alexander from Gulfport Yacht Club, took first in 2 of those races. The Carolina Yacht Club finished off the day with a shrimp boil dinner for the class under the club’s Boathouse. With lighter northerly breezes and a strong flood tide, there were 3 races on Saturday starting out by Fort Sumter. After racing the competitors heard a chalk talk hosted by the new distributors for the boat: Sailing, Inc.’s Bill Wiggins and Vela Sailing’s Rod Favela. Sailing on Sunday was moved up 30 minutes to take advantage of the predicted weather. With the breeze on, it was key to start with speed, get clear air, hike the boat as flat as possible and put the bow down in order to go fast forward. Local Bill Wiggins on SendIt led around the first mark and popped the kite for thrilling downwind action before happily settling for second in race one. Sailing in a major VX One event for the first time this weekend, 2016 J/22 World Champion Mike Marshall learned quickly. He took a 1 and 2 on the final day to move his team in second place overall. Ultimately, he bowed to Chris Alexander’s experience in the VX. With John Bowden and Caroline Main onboard, Chris scored just 19 points over 9 races with one throwout. This 19-foot sport boat is building momentum, with 2 new distributors and rapidly growing fleets from South Carolina to Toronto. Next year’s North American’s are scheduled for Newport, RI. 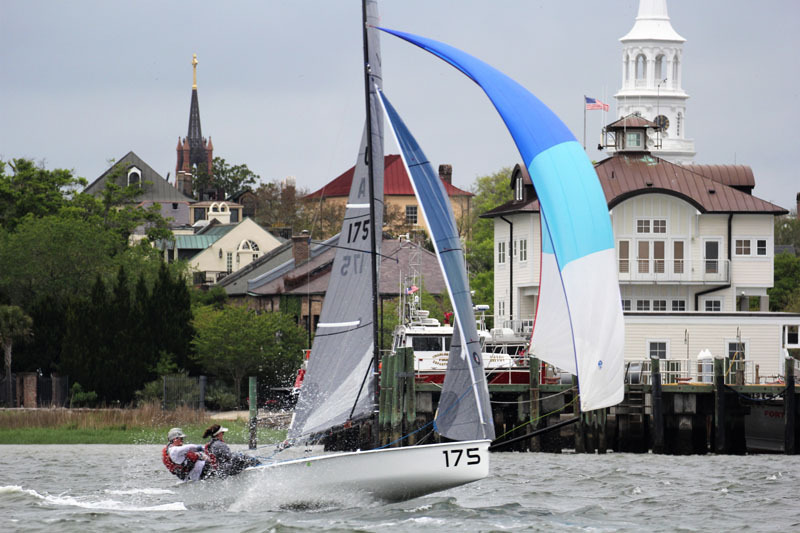 30 VX Ones are set to race in our biggest event of the year hosted by Carolina Yacht Club in Charleston, SC! Racing takes place from Friday 11/2-Sunday 11/4!